Enjoy all the flavours you love in a matcha latte now in an easy & healthy chia pudding! Yum! Whisk all the ingredients together in a bowl until well combined. Place in the fridge for at least an hour before serving. 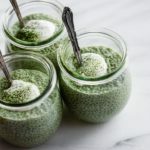 Store this chia pudding in an airtight container in the fridge for up to a week. I also love this chia pudding topped with fruits like blueberries or bananas!